Miami Club casino is really getting into the festive spirit this weekend with a special Funky Chicken and Fat Cat freeroll tournament with a $1500 prize pool and a special no deposit bonus offer to celebrate the launch of their new mobile casino. This special Thanksgiving freeroll slots tournament is running until the 11th of November and Miami Club casino is giving all their members a chance to take away $500 in cash in their Giant Weekly Freeroll event. 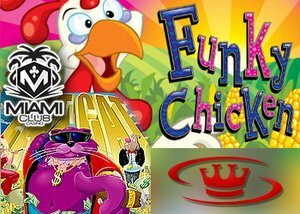 All you have to do is play the featured Funky Chicken slots game to be in with a chance of winning. Funky Chicken is a 5 reel, 25 payline video slot machine with a maximum jackpot of 5,000 coins, a free spins feature, scatters, and multipliers. The buy in for this event is $0 and the cash prize up for grabs is $500 for the person who is placed at the top spot on the leaderboard. Running from the 5th to the 15th of November is the "November Spins Tournament" where there $1,000 up for grabs every week. These Miami Club casino tournaments run for eleven days and feature unlimited rebuys and a prize pool of $1,000 with a single first place prize of $500. The November Spins Tournament takes place on the Fat Cat slots game which is a 5 reel, 9 pay line machine with a maximum jackpot of 5000 coins. It also features scatters, multipliers and a great bonus round. The buy in price for this slots tourney is $5. This top performing online casino is also celebrating the launch of their new mobile casino software and as a treat all new players who sign up for an account with Miami Club can for a limited time claim a special $10 Thanksgiving no deposit casino bonus. This can be used to test out all the games including those on the new mobile casino. On top of this, players can claim up to $800 in bonuses when they make a deposit. This welcome package is a 100% up to $100 match deposit bonus on your first eight deposits. If you are not already a member of this online casino then we strongly recommend that you sign up for a real player account today and take advantage of all the great offers they have running at the moment.